Rane Serato Scratch Replacement Vinyl (red) DJParts - All Variety of Parts that DJ Needs. 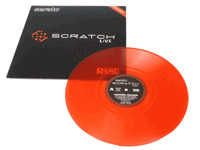 This is the limited edition, highly coveted RED vinyl from Serato, made for Serato Scratch Live 1.2+. The second edition is obvious from the red band on the upper right corner of the sleeve. The label on the vinyl, besides being marked CV02, has large A and B markings to easily tell between the 10:00 and 15:00 sides. Scratch LIVE software version 1.2 and higher is required to use the second edition vinyl.